Continuing our exploration of the burgeoning Gowanus restaurant scene, we next visited Runner & Stone, a boulangerie and cafe featuring the superb creations of former Per Se head baker Peter Endriss. Situated across the street from Littleneck, Runner & Stone has the opposite decor – a sleek and modern two-level space with a skylight illuminating one room (don’t worry, there is still some exposed bricks; it is still Brooklyn). The French-inspired bakery is paired with a reasonably priced seasonal Italian-influenced American menu. 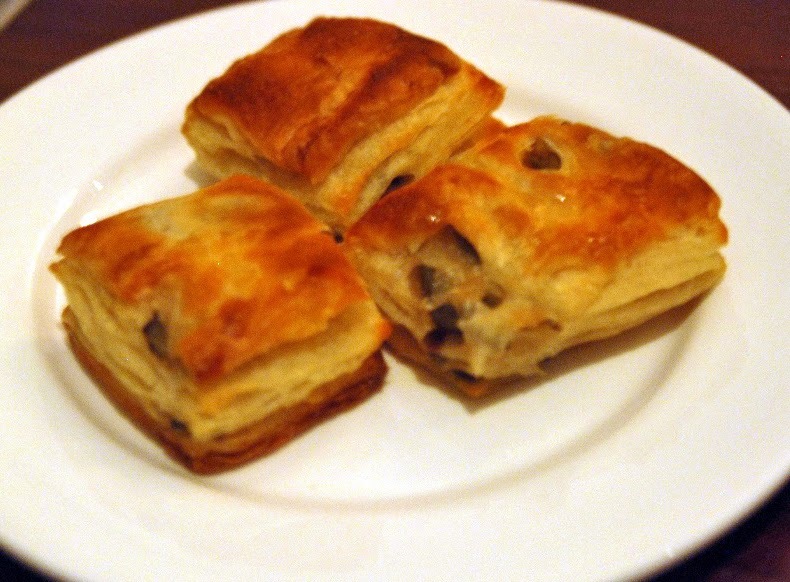 Many of the best dishes seamlessly incorporate the bakery’s creations. Before we could order anything, Runner & Stone wasted no time showcasing Endriss’s originality, bringing us, as an amuse-bouche, some olive-filled square croissants, an unlikely but excellent combination. The layers of the dough were crispy and buttery, and the olives added a nice salty kick. Why can’t more croissants be square? We also enjoyed the bread basket, especially the slices of buckwheat baguette with salted, room temperature house-made butter. 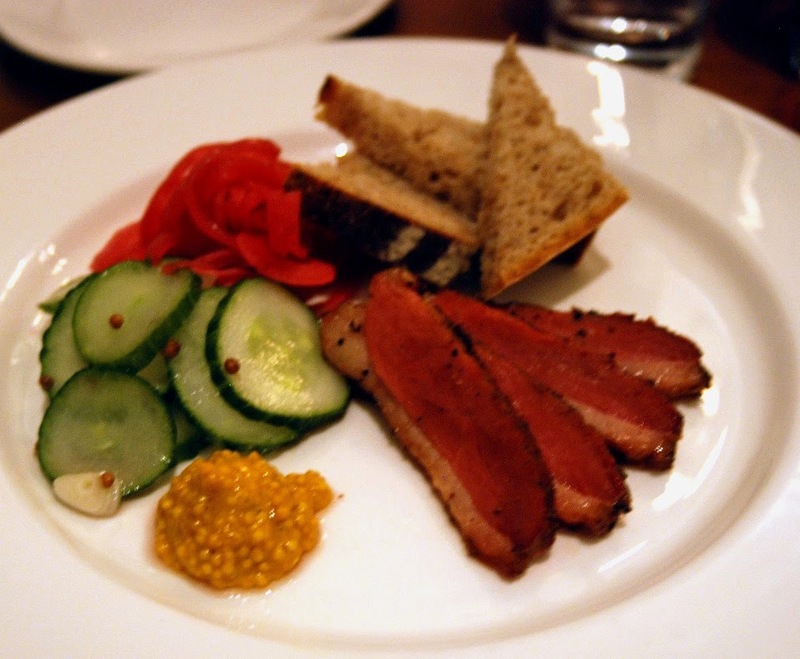 After our carbo-loading, we finally received one of the dishes that we actually ordered – a pepper and coriander rubbed duck pastrami with pickled cucumbers and onions, beer mustard, and some triangles of rye. It is probably Runner & Stone’s best dish, with all the spices, pickles, and mustard coming together in bold harmony on top of the soft rye. A baby beet salad with yogurt walnut dressing was fine but not spectacular; the yogurt dressing tended to overpower the more mild beets. 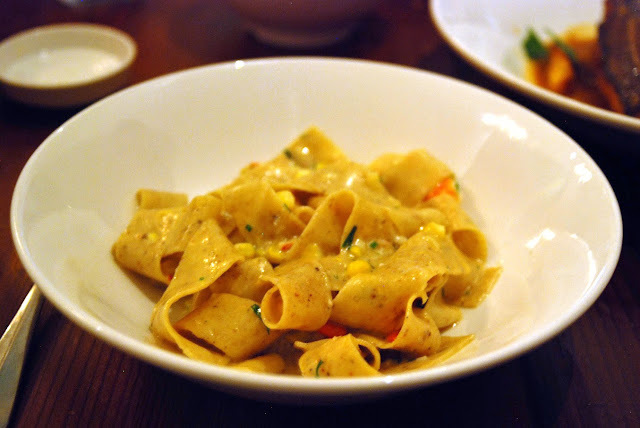 We loved the fresh stradette pasta with lobster, corn, butter, and herbs. Stradette is a thick, ribbon-shaped pasta, made with cornmeal, and it imparted a great corn flavor. The rich dish reminded me why both corn and lobster are always well-paired with good butter. At $17 it was also a great value, though I would have paid more for more lobster. 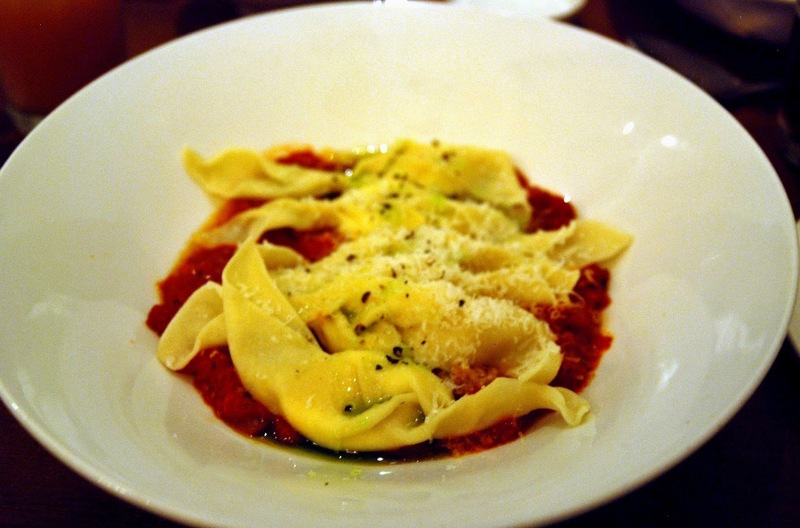 Another inventive pasta dish was a braided ricotta ravioli with tomato jam and basil oil. The tomato jam was essentially a thick tomato sauce with its full cooked-down flavor enhanced by the strong tang of the basil oil. The braided raviolis had a very interesting shape, which added to the presentation. 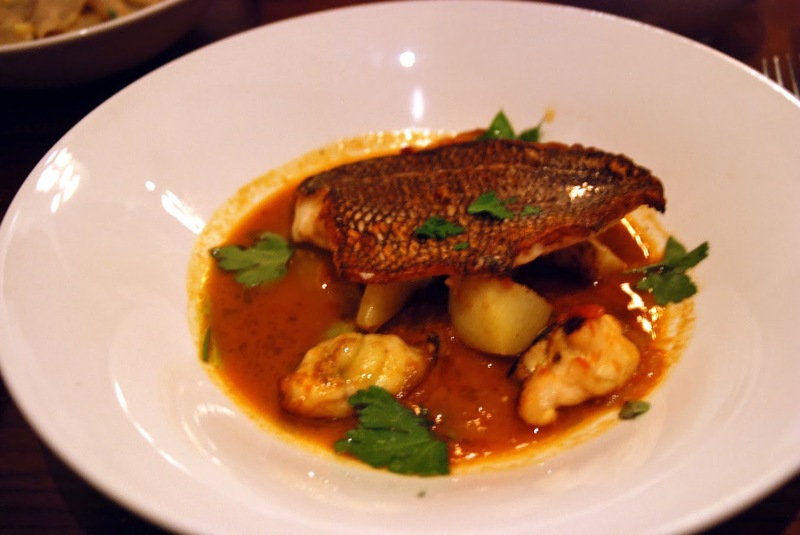 A two-fish special of sea bass alongside pieces of monkfish in a lobster broth somehow worked nicely. The bass was served crispy skin-side up and allowed you to explore the various textures of the dish. The service made us feel welcome, helpfully explaining certain dishes, and offering our pregnant dining companion a refreshing grapefruit mocktail. (Every respectable restaurant should have a good mocktail available; it goes a long way with customers who are pregnant or who otherwise do not drink so that they do not to feel left out). Runner & Stone also staffs various farmer’s markets with their breads, including a relatively new Sunday market in Pier 6 in Brooklyn Bridge Park. The homemade pretzels are to die for. Use their baguettes to make crostinis for your next party. Dear lord those noodles look good. Thick wide noodles are the best. I make homemade every month or so….little flour…egg….and I have it drying everywhere. ANyway, a thick wide noodle with a lobster cream sauce…and some cognac…..delicious. Nice work, Steve. We admire a good homemade wide noodle ourselves, rolled out into sheets and hand-cut. We shall be doing a piece on that at some point. In the meantime, this lobster pasta is a knockout dish. Those are some good-looking soaps on your site, by the way.